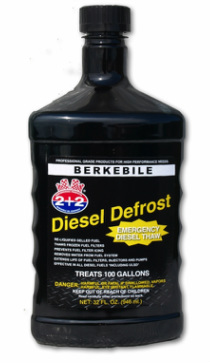 BERKEBILE 2+2® Diesel Defrost is specially formulated to thaw diesel systems that are already gelled. Simply install it in gelled fuel tanks and fuel filters, and it will liquefy the fuel and get your engine running instantly. To Liquefy Diesel Fuel: Add 32 ounces of Diesel Defrost to every 100 gallons of fuel. Remove fuel filters. Fill fuel filters with 50% Diesel Defrost and 50% diesel fuel. Re-install fuel filters. Start engine and allow to idle until warm. Treat fuel with Berkebile Oil 2+2 ® Diesel Conditioner and Anti-gel to prevent further gelling. To Thaw Frozen Fuel Filters: Remove fuel filters and empty any liquid or gel. Fill fuel filters with 50% Diesel Defrost and 50% Diesel Fuel. Reinstall fuel filters. Start engine and allow to idle until warm. Treat fuel with Berkebile Oil 2+2 ® Diesel Conditioner and Anti-gel to prevent further gelling. To remove water from fuel system, treat according to the instructions. For biodiesel blends (B20) use double the amount of additive.